Welcome to IAUK - the insurance recruiters to help you. Finding a new job is hard work, so let us take the strain and help you find a role that matches your personal, professional and financial circumstances. Having been established since 1975, we are the UK's original recruitment agency for the general insurance industry and loss adjusting profession. We have developed knowledge and expertise which qualifies us more than anyone else to give you the help and advice that you need to find new recruits for your insurance business. Our recruitment consultants uniquely understand the markets with brokers, insurance companies and loss adjusters whether that be on a local, regional, national or international level. Our aim is not to find you a new insurance job, but to give you the essential career advice you need. Uniquely if we think that your career is better suited to staying where you are, we will tell you, but if there is a better position elsewhere our agency will work with you accordingly to find that role. The key is that our recruiters will work with you, in partnership, to find that perfect match. Our recruitment consultant force combines over 60 years' experience of recruiting in general insurance and loss adjusting, and that qualifies us more than anyone else to help you find a job in insurance, so whatever your situation, that general enquiry has to be worthwhile. When it comes to recruiting we believe strongly in employing recruitment consultants who have extensive experience of working in the insurance industry in which they recruit. This means that all of our consultants genuinely understand the jobs that they are recruiting for, what the job entails and whom it would suit. 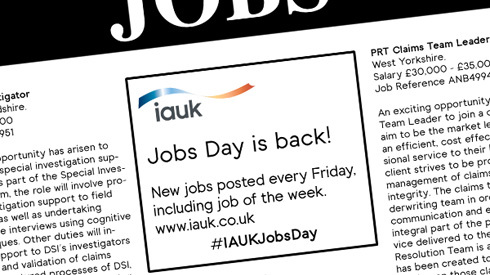 So pick up the phone and speak to your nearest consultant for a free and confidential chat about your career and your job aspirations or drop an email to our email address at recruit@iauk.co.uk.